Will pop-up shops save Todd Mall? Maybe, says Ann de Marco (above, centre), but let’s not expect an easy remedy to the decline of business in our Main Drag: It’s all about what you are selling, and how you are selling it. After 35 years of trading in the northern end of Todd Street, the last 24 of them as it went through several incarnations of a mall, the unfailingly successful owner of Novita Gifts wouldn’t dream of leaving it. And that’s while shops on her eastern side are shut or battling, and the Plaza on the western side is – finally – joining the latest resuscitation bid. When for months the $5m Mall upgrade was under way, amidst dust and noise, and piles of dirt making access to her shop all but impossible, Ms de Marco stood her ground. And customers said they would climb mountains to get to her. Now, as a good part of the area resembles a ghost town, and locals are taking flight to online buying, she has doubled the size of her shop, and it’s business better than ever. 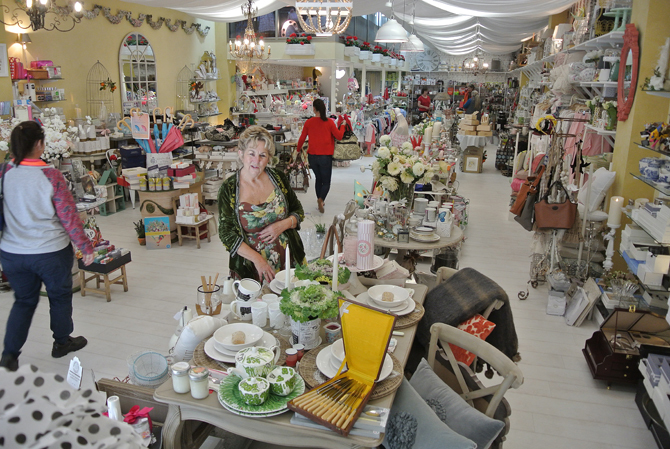 “We’re open seven days a week, keep high quality stock, give good service, and we’re price conscious,” she says. NEWS: How do you cope in this online shopping world? de MARCO: Ours is a very touchy-feely shop. People still want to have the experience. Some customers might see it online, and they come in and ask me if I can get it. They do the research. We’re very happy to get in, and my many suppliers don’t mind. NEWS: What kinds of goods are people reluctant to buy online? de MARCO: You’ve got to have something different, something somebody else hasn’t got. People want to have the variety. They don’t want to go into all the shops and they all have the same. NEWS: Why are you in the northern half of the Mall? de MARCO: This was major: I did not want to move away from here. The Mall has never been an issue. NEWS: Aren’t the rents too high? de MARCO: This is Alice Springs. It’s not a major city. It’s better to have people doing business than not to. Rents shouldn’t be everything. Traders have to be able to put the stock on the shelf. NEWS: So some rents are too high, then? de MARCO: They are too high. I mean, it’s not the city. They have got to be realistic. NEWS: How do the landlords get away with it? de MARCO: I’ve got properties in town and I am always very happy to have them occupied. de MARCO: Yes. None of my properties are overpriced. NEWS: The Town Council is promoting pop-up shops. de MARCO: They are a good idea. Of course, if there is something in the window instead of it being empty, that’s great. We need stable shops. I think the success of Novita is customers know they can trust me. I’m going to be open, 9 to 5.30 five days, 9 to 4 on Saturdays and 9 to 2 on Sunday. I wouldn’t dream of cutting back these hours. You’ve got to be here for people who are working. People come from the bush and they want to see the shops open. And it’s all about trust. NEWS: Is there a case for shops opening in the evenings in summer? NEWS: What about a siesta, say 2 to 4? de MARCO: No. You’ve got tourists walking around. We need the shops on a Saturday to be open longer, people can have an afternoon tea. People won’t go out if there are no shops open. Back in the early eighties when there wasn’t much in the way of shopping elsewhere in Alice and the mall didn’t exist (mall appeared in ’86), Todd street contained a number of shops for locals and services, but post-mall, they drifted away as shoppers couldn’t park outside those shops. Getting rid of the mall completely probably wouldn’t bring back the shops for locals and now that tourism is a little different and not as much Aboriginal art seems to be selling…well, who really is going to go there? But good luck anyway with whatever is tried. A very shopping oriented article. But the mall should be far, far more: a place to linger and chill. Adelaide House and the church grounds allows such an experience. The mall should be a place for shopping, relaxing and al-fresco long breakfasts, lunches or dinners uninterrupted by art hawkers pushing into your table / personal space. Some brazen ones even venture inside a business and I observe are rarely chased out by the owners. Live music and buskers that complement, not dominate, adds a lovely touch to the atmosphere. Personally I find those video monitors a huge waste of (my) money. Why would anyone want to stand and watch, especially in the heat? Never seen a soul watching. Noise and visual pollution really. The new Tourist Information building is a lovely hub with a great feel. However the large graffiti on top of the former (now empty) On Safari building beside the relentlessly abandoned tavern are both a very bad look. Seems those mall cameras are pretty useless at preventing (or catching to cleanup) this sort of anti-social behaviour. Do the camera still exist? Bringing a small supermarket back to the top of the mall is long overdue. A small, mall opening, brightly lit 7/11 type supermarket open late (security issues?) would be great for all and especially tourists. I hope that Cam’s coffee hub up by the cinema survives longer than its predecessors. Good on you Ann. A business success due to giving the customer what they want rather than expecting the customer to take what’s offered. I also think it would be good to see pop up shops encouraged. As well as bringing some activity into empty spaces, they could lead to more permanent businesses. Art and craft exhibitions would also be great as a pop up in the Mall as would food stalls. All worth a try and encouragement.